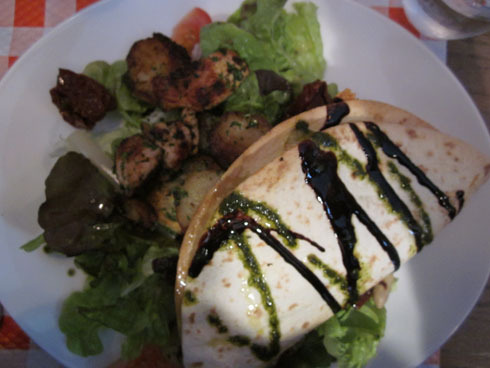 Our two main activities in Paris last week were eating and walking. If it hadn’t been for one, we would never have been able to do the other. One afternoon, we explored a neighborhood that is straight north of Notre-Dame. It is pretty far away from any of the regular tourist areas, near the metro stop Etienne Marcel. Armed with the info that the “rue Montorgueil” is a street worth checking out and the names of a few restaurants to consider, we found it on the map and headed in that direction. 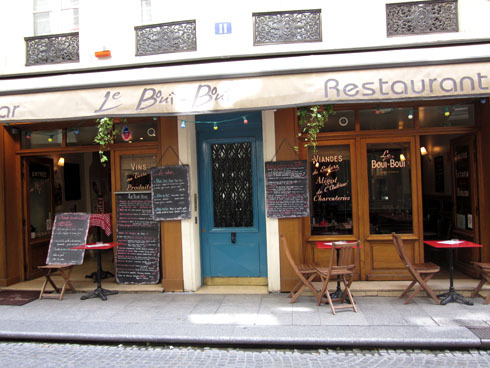 Not able to find the restaurants we were searching for, and exhausted after so much walking, we settled on one we found on a side street off of rue Montorgueil. We lucked out with Le Boui-Boui. It is a cute restaurant, the menu had plenty of items from which to choose, and the people were very friendly. The menu appears to change regularly, and items are only available until they run out. We had a variety of items, and loved them all. I had a chicken salad that I’ll probably be busy trying to recreate for the rest of my life. Lightly dressed greens with fresh herbs, chicken, roasted potatoes, fresh tomatoes, a tortilla with melted goat cheese, topped with a little balsamic and pesto. It was hearty but not heavy, full of flavor but not overdone. And although we were full, we had dessert anyway. Once we saw the dessert menu, we couldn’t pass up the apple gelato topped with Calvados. 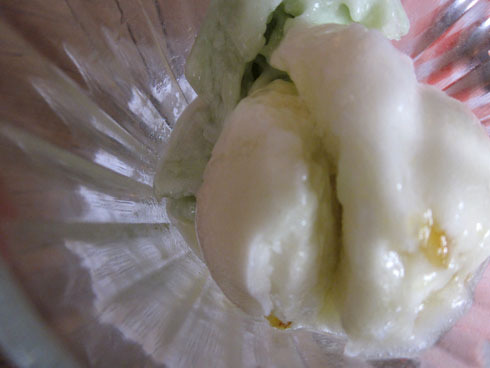 The gelato had a bit of a citrus taste with tiny bits of apple, all made a bit float-like with the addition of Calvados. It is worth the effort to find this location – you’ll be glad for the break from tourist areas, and the food was some of the best we had in the city.